to complete the signal to noise meter previously posted i wrote up an apple script which calculates a ratio of messages in my mail inbox to the junk messages which have been caught. the apple script then sends that ratio via serial to the signal to noise meter. i’ve set up a rule in mail.app to trigger the script every time a message comes in. the serial output (ascii only, it seems) is thanks to SerialPort X.
it’s certainly not perfect…having a lot of read messages stagnating in the inbox brings the ratio down…but i’m posting the code below so maybe someone can figure a better way. also, the script wasn’t triggering when called directly from mail’s rules…my workaround was to have a launcher script run ‘do shell script “osascript ” signalToNoise.scpt’. for some reason this worked when the launcher script was triggered by mail – YMMV. oh! it just when off as i was writing this entry…the light came on, and the needle swung high….i need to clean out the junk mail! …look at my pinwheel and see what i’ve found. here’s the promised update to the earlier pinwheel post with a video of it in action. this is just a demo of the animation, i’d like to work more on the compositing and to add some user interaction. 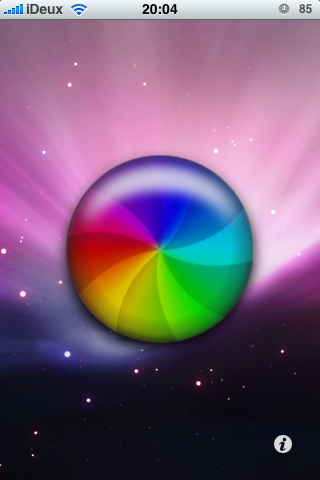 i’d like to perhaps have a user blow on the phone and cause the wheel to spin more quickly. for now, this is what i’ve got. Meggy pixel video display. 4-in-4, day one. Spent most of the day at Tymm’s house, pretending to participate in 4-in-4, but mostly drinking coffee and watching videos. I did eventually get around to tinkering with my new Meggy Jr RGB from Evil Mad Scientist Laboratories. The Meggy is a pixel game platform built around a vivid 8×8 LED matrix running an Arduino compatible ATMega168. EMSL has also released a simple to use library for managing the display, buttons and speaker. It’s really a great kit.